Assuming things can be a bit risky. I was delighted when I found these Spotify widgets that I could embed on my pages for promoting my music. ..and for those that have a Spotify subscription this is good. But not really for the rest of the world. I was finding that I was getting quite alot of traffic to on of my pages that had a Spotify widget at the top but there was no increase showing in the statistics on Spotify. After a quick check of my page using another computer than usual I understood why. Even though the widget looks like it can play the song, it can only do that if you’re logged into Spotify. If the play button is clicked the user is asked to log in (and most people won’t bother). I’ve now moved the Spotify widgets further down on the pages and have SoundCloud ones at the top instead. That is much more effective as it requires no sign in. This entry was posted in Marketing, Music and tagged ads, Music, sporify, web, widget on May 21, 2014 by sverrirv. I’ve been experimenting with online ads using both Google AdWords and AdMob as well as Facebook ads for the last week. Now, to begin with, the comparison will not be completely fair, as Google was running a campaign that gave me a coupon of 750 SEK (the very nice support at AdWords arranged that for me when I asked if I could be eligible for their ongoing campaign) while there was no such campaign on Facebook and thus my budget for testing there was significantly smaller than on the Google services. I have yet to find a similar possibility on Facebook to get started. Anyway, I think I might have some preliminary findings that are of interest. Firstly, Advertising an application with AdMob has been quite effective. Even at low daily budget of 20 SEK/day it was effective. Weekends were especially good. Advertizing music using Googles AdWords ads was however not as successful. The Ads got the clicks and thus visits to the sverrirv.com page of the tracks, but very few people stayed on the page to listen, and then only using the SoundCloud links (not Spotify). In fact, my Google Analytics data indicates that most people that got drawn in to the pages via ads didn’t stay on the page at all (0 seconds). I guess that means they clicked the ads by mistake in most cases. Facebook was just as unsuccessful as AdWords when it came to getting people to play the Spotify music. I guess that has to do with the requirement to have a Spotify account and that many people don’t have that. Facebook was however quite good at getting plays of the SoundCloud links. That’s reasonable as the music can be listened to directly in Facebook, not requiring the user to do anything at all other than listening. My conclusion from this is that I will do my next experiment on Facebook with music and perhaps do another drive for my application using Google AdMob. I’m not getting people to listen to my songs by using AdWord at the moment (not necceseraly a fault of adwords. Can just as well be my website design that drives people away). This entry was posted in Marketing, Music and tagged AdMob, ads, advertizing, adwords, cpc, Facebook, google, Music on May 19, 2014 by sverrirv. I’m truly surprised I have to admit. The Lovur app has seen q uite some spread. Of course, it’s due to that I have been experimenting a little bit with ads with Google AdWords but I never thought it would get this kind of spreading and that users would return! 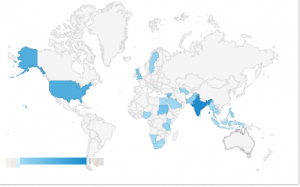 The ads have focused on US, UK and India but there is some spread also except for those countries and it’s increasing every day. Do the ads run in other countries than I’ve selected? I don’t know.. Anyway. The app lication is not a hit by any means, but it’s got a lot more than the expected 0 users, and the users are well spread and some are returning. Quite satisfying for a few hours of learning HTML5 I must say. This entry was posted in Marketing, Music, Programming and tagged AdMob, ads, advertizing, adwords, Facebook, Lovur, Music on May 13, 2014 by sverrirv. My music is a hobby. I’m lucky enough to have a good job that I really like and I don’t have to depend on my music to put food on the table (it would not be a lot of food…). But, it would be very interesting to know if I could make any real money of it. To do that I need listeners, and that means that I need people to know that I exist, or at least that my music exists. So I am doing a very small experiment using AdWords to promote one of my songs. I chose the song Smygehamn , as it is linked to a place, and the place is quite popular during the summer months for tourists. So the question I’m trying to answer is if the ad actually manages to drive any traffic to the homepage of the song, and also if it leads to any purchase or streaming plays. Time will tell, and I will write again here in a while about how this has turned out. This entry was posted in Music and tagged ads, adwords, business, experiment, Music on May 9, 2014 by sverrirv.